Today was our second ultrasound appointment and I'm pleased to say we still have an active little fetus with an active little heartbeat, giant alien head and spindly limbs flipping about inside my belly. 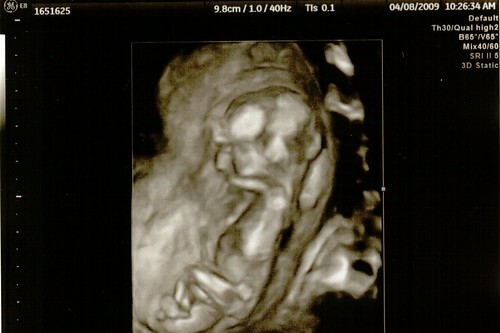 Even in utero, this child has decided to be obstinate in that it took us a good 45 minutes of moving around, coughing, lifting one hip and nearly doing jumping jacks to get the baby to move to the right position to measure whatever they were messing with. I was just happy to get 45 minutes of BabyCam while we waited. In other news I finally have back some of the energy that has been sapped out of me the last few months. I'm staying up past 9pm and I might even log onto World of Warcraft to run around with my woefully neglected hunter. In commemoration of making it this far, I've created a playlist for us all. I figure since I finally have some energy back we should at least use it by gettin' our boogie on. I hope you enjoy it.